Cosmetic Dentists in Corona, California, Azusa, California, Santa Ana, California, Pico Rivera, California, or Ontario, California. You might have not been born with a killer smile, but you can certainly have one, and it’s much more affordable than you think. With vast experience in cosmetic dentistry our cosmetic specialists can turn your smile into a celebrity smile and they will make sure you can afford it. City Dental Centers uses various appropriate technologies such as Veneers, Invisalign®, Implants, and Lava crowns to completely enhance your smile and facial structure. Furthermore we will use other tools such as the lowest prices, 0 % financing, Discount Dental Plans, and maximum use of your benefits to make it very affordable. So the Hollywood smile is not just for celebrities, You can easily have one too. 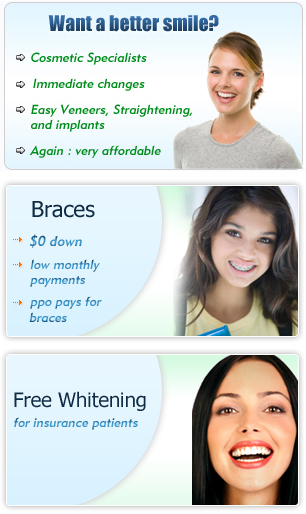 Get a Whiter Smile in One hour by the latest from at your City Dental Center. A tooth-colored filling or a white filling is the best choice. They do not only match your natural teeth very well, they are also very tough and last a long time. City Dental Doctors use the latest technologies and the latest material. They will also ensure that the procedure is pain-free. Get your old metal or stained fillings replaced with the latest cosmetic material to increase your confidence when smiling , talking , or laughing out loud. If you have any reason, that prevent you from smiling with confidence , Veneers may be the easy solution for you. With years of experience our City Dental Doctors have been giving brand new smiles to thousands of satisfied people like you. 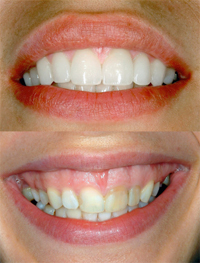 Bright, straight, attractive smiles can be accomplished for almost anyone with simple veneers. It is a pain free procedure that is usually done in two visits, two weeks apart. 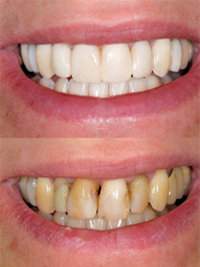 However, in some cases same day Veneers are also done. In most cases local anesthesia is administered. To prepare a tooth for a veneer, your City Dental Doctor will remove some enamel from the tooth surface, which is an amount nearly equal to the thickness of the veneer to be added to the tooth surface; therefore the amount of tooth removal will vary depending on the need for the thickness in different spots of the tooth. After reshaping the teeth as needed, your dentist will make a model or impression of your tooth. This model is sent out to a dental laboratory, which will construct your veneer. It usually takes 2 weeks for your dentist to receive the veneers back from the laboratory. 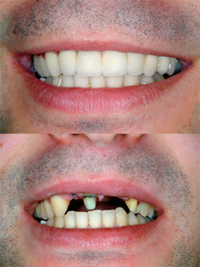 In the mean time Temporary Veneers are placed on your teeth.